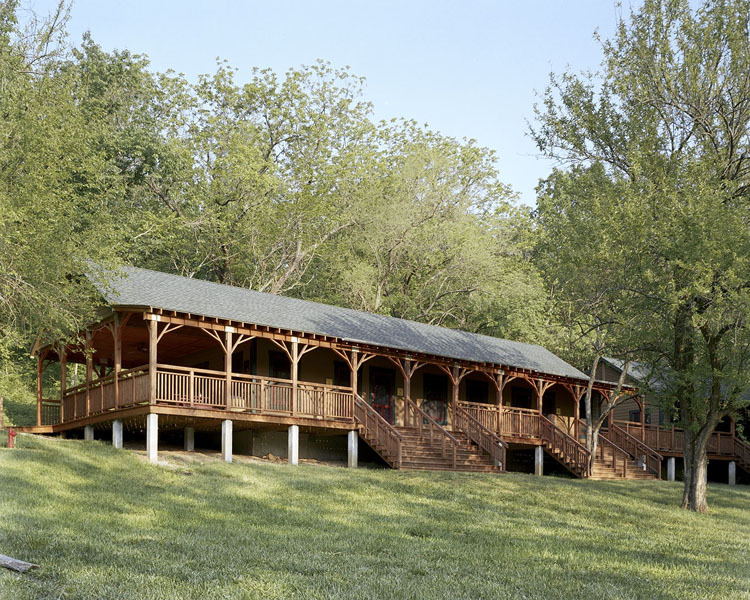 The Heartland Presbyterian Center is a 320 acre, heavily-forested conference and summer camping retreat in Parkville, Missouri. Founded in 1958, it is well known for the quality of facilities, programs and outdoor experiences. Pete’s Cabins and Meeting Hall, named after a long-time camp director Pete Rasmussen, was built to replace the old and deteriorating cabins used for summer season youth campers, and also to provide more comfortable quarters for adult conference attendees in the off-season. 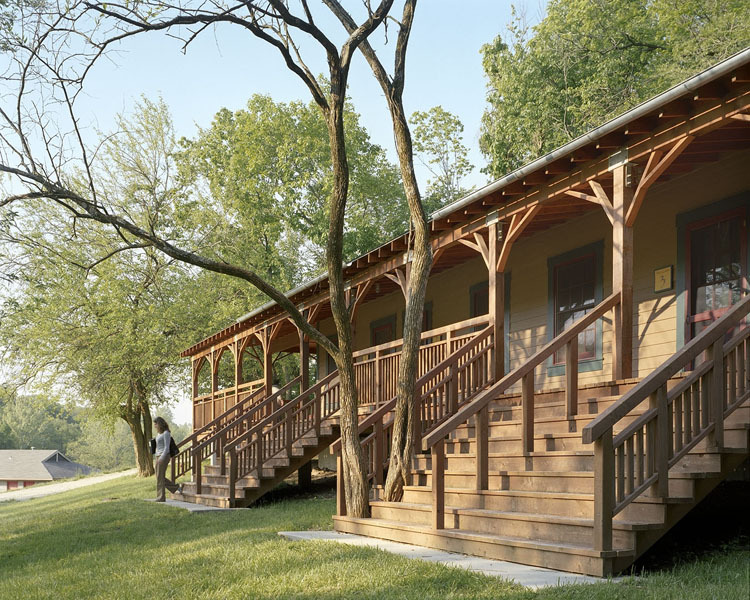 The cabins are arranged as a pair of buildings (one for boys and one for girls) each accommodating two large bunk rooms for ten, connected by long front porch. The design is a blend of Adirondack, Craftsman, and National Park Service. 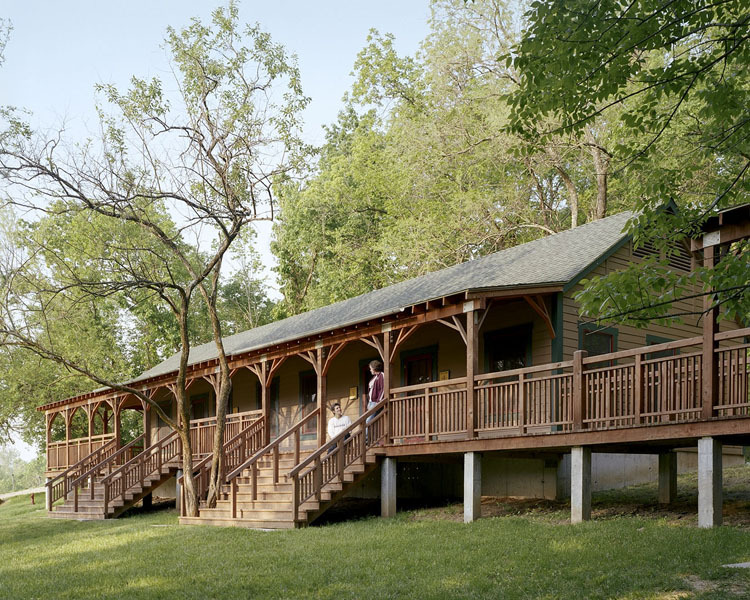 Earthy color schemes and craftsman hardware were used throughout; creatively designed “tree-trunk” porch columns; stained bead board ceilings; open eaves; exposed porch rafters and rustic furniture all add to the evoked memory of late 19th and early 20th Century camp facilities. Creative planning was required to accommodate the flexibility and allow for staffing efficiencies. By the use of strategically placed pocket doors, it allowed each pair of adjoining bunk rooms to be staffed with only one camp counselor. The bunk rooms are convertible to smaller quarters for conference attendees through the use of sound absorbent, retractable room dividers; separate entrance doors, and bathrooms. Although each unit is equipped with individual air conditioning units, careful window placement allows for cross ventilation to capture the cooler night air and thus maintain the summer camping experience. 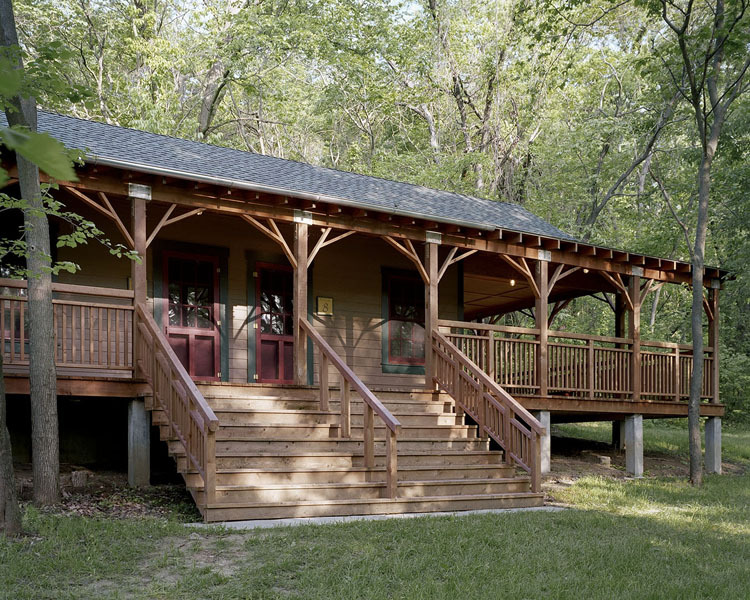 The long, front porch terminates at both ends with large outdoor gathering spaces – one for each cabin – so that outdoor programs can still take place even during raining days. Wide front stairs were created for places to sit as well as walk. At one end of the long front porch a future meeting hall building has been designed. This third building includes an entrance / lounge area (complete with indoor / outdoor fireplace and two accessible bathrooms); a meeting room which can be divided into two halves (one for each cabin); a warming kitchen which is also planned to be used by two difference parties at the same time, and its own large outdoor porch. This three-building cluster was carefully arranged along the edge of a hill, blending naturally with the landscape, creating an edge to the clearing that effectively becomes the front yard of the complex, and providing a transition to the forested hill beyond. Pete’s Cabins has been remarkably well-received facility by both campers and their families and conference / retreat goers alike. It is the most requested accommodation at the Center and is booked well in advance. Future fund-raising efforts will allow for the construction of a second pair of cabins and meeting hall on a nearby hillside.